I’ve heard the following lines in numerous guises over the years. If opponents are trying to eliminate or seriously hinder your license to operate, they usually try to chip away at it, one step at a time. Think alcohol: opponents may want to ban it, but stepping stones towards a ban include marketing bans and the like. Organisations get this, and term it a “slippery slope”. Their approach is thus to forcefully oppose every step of the “slippery slope”. Which probably seems like the only sensible thing to do. But the truth is, once you’re on a slope, there is no way back UNLESS you reduce the number of people who oppose your right to exist. Fewer foes, more friends. And belligerence aimed at stalling every instalment of a slippery slope will mean more foes and fewer friends, and no return from the slippery slope in the long-run. This might sometimes be the case. But it over-simplifies the environment in which we operate. If you get your message out… Criticism will cease? People will like your more than the competition? People will think you’re truly innovative or sustainable and should get favourable treatment? Investors will come flooding? Perhaps, but unlikely. Focusing purely on message dissemination avoids more pertinent things that need to be thought through first. Why have you not got your way? Why are others more popular? What do they do differently? What do people really think? Who are your friends and foes? Is this really a communications issue or is it systemic? It also diminishes what might be achieved through communications. “Get the message out” implies that people simply need to be made aware. But communications can go deeper than that: it can drive action and advocacy which are far more powerful than a mere message. When the public/media narrative is against you, it makes sense to want to change it. But this implies that it is possible to “change a narrative” through communications. It isn’t, usually. An oft-heard story in Brussels involves a lobbyist for a sugary drinks manufacturer insisting that their industry should seek to shift the narrative from the danger of sugar to the danger of dehydration. Good luck with that. “Changing the narrative” through communications is a fallacy: it implies attention spans are so short, or that people care so little, that they will simply shift between viewpoints having seen a marketing-communications campaign. If the narrative has been determined, trying to shift it without changing behaviour is nigh on impossible. Moreover, attempting it smacks of dishonesty, or avoiding responsibility. Best to address narrative X head-on, however challenging. Only then might the narrative begin to shift, slowly. A senior public affairs professional was hoping to convince a bright young graduate to join his agency. She had just completed a round of placements at several communications agencies that were part of the same larger holding company. Being very talented, she had the pick of the bunch. But she was torn between a marketing agency and our friend’s public affairs agency. Now clearly, Mr Public Affairs was selling his discipline and agency, so the bravado (or breath-taking arrogance) should be seen within that context. He is bright enough to know that not all public affairs is quite so existential as defending a license to operate. And that marketing is about building markets, without which there is no business. Henc a tad bigger than “selling detergent” implies. Nonetheless, his question does reflect where some public affairs practitioners believe they sit in the hierarchy of communications disciplines. Which is a shame, as they are less likely to think that they can learn from others, like marketers. So what do marketers tend* to do better than public affairs practitioners? * we’re generalising here: there are plenty of poor marketers and impeccable public affairs practitioners. Ask a public affairs professional what their objective is and they’ll invariably give you ten. No one can meet ten objectives. Their output will reflect those ten objectives. Diluted and confusing, it is less likely to work. Marketers are taught to narrow down on a single-minded proposition: the one most important characteristic of their product or service, and to build their communications around it. Many marketers ignore this tenet, while others have a poor SMP, but generally, they’re better at it than public affairs folk. The practice of marketing is more codified than public affairs. There is a rough rule-book of best practice which people follow, just about. Sure, some follow it badly, and others follow an outdated rule-book, but by and large there is some method to the madness, be it: following a process from market analysis through to execution; defined roles and responsibilities; measurement tied to ROI. Most public affairs professionals, however talented and successful, will have their own definition of public affairs and take on how it should be done. Which means there is no general acceptance of what best practice is. Cue: unnecessary disagreement on process, and poor practitioners getting away with delivering bad work because the bar has not been set high enough. Marketers who fail to help sell their product will be out of a job. Most public affairs practitioners will keep their jobs even if they fail to meet the public policy objectives they have been set because their ‘outputs’ are in themselves quite challenging. Te following can quite easily be sold as results in themselves: developing relationships with important policy-makers; building coalitions with organisations who are not necessarily friendly; staying on top of complex policy developments and ‘translating’ these for the business; producing meaty positions. Might some public affairs professionals be more successful if they were more accountable for a genuine end-goal, like (most) most marketers are? Probably. Public affairs professionals spend too little time figuring out what their audiences really want or need from them. How many inspect VoteWatch.eu? Or simply ask: “what would make you support us” OR “what can we do to make your life easier?” Or leverage public sentiment by conducting polling? As far as I can gather, not enough. Market/customer research is compulsory in marketing. It’s no doubt done badly in many instances, but no marketer would ever ignore it entirely. Following on from the previous point: some public affairs professionals fail to adapt their message to their audience. Whether speaking to a Finn or a Greek, or a left or right-wing politician, or officials with different portfolios (enterprise vs. environment, say), their message remains the same. Marketers will vary their pitch depending on where a person is in the customer journey i.e. someone who has never heard of you vs. a recent customer vs. a loyal customer will be treated differently, in terms of tone and ask. Again, plenty of marketers get it wrong no doubt, but the principle is at least pretty ubiquitous. p.s. the clever graduate joined the marketing agency. It could be argued that ‘digital strategy’ is a misnomer in communications. Why? Because digital strategy should stem from an overall strategy. And strategy – defined simply as HOW to deliver against an objective – is inherently bigger than just one channel. Common strategies in communications for public affairs ends (and beyond) might be: positioning your organisation based on a certain trait; focusing very narrowly on a specific locale or audience segment; distinguishing yourself from the competition based on something you do differently; or leveraging a certain person (e.g. a leader) or group of people (e.g. employees or an influential 3rd party constituency). None of these strategies can succeed if delivered on a single channel. There are of course considerations that relate to digital when developing strategy. One’s choice of strategy may involve a heavier dose of digital if a programme goal is more likely to be achieved through online means e.g. think many grassroots or public rebuttal programmes. There are also specific decisions that need to be made around digital delivery, which can be deemed strategic considerations, such as: channel selection; tone of voice; who communicates on behalf of the organisation; or the extent to which to engage publicly. But the bottom line is: actual communications strategy, and the steps that lead to it (especially audience and environment analysis, and alignment of business/organisational goals and communications goals) should ALWAYS be channel agnostic. Having said all that, we should not scoff entirely at the notion of digital communications strategy, for a few reasons. As alluded to above, digital can affect one’s choice of strategy, so communications strategy needs to be developed by individuals with a decent understating of the medium. As also alluded to above, there are numerous strategic considerations to ponder in relation to how a communications strategy should be delivered online. Most interestingly perhaps, digital strategy development often drives better overall communications strategy. Why? Because ‘traditional’ communications programmes often get away with ignoring essential initial planning phases (audience and environment analyses etc.) Digital is often (but not always) scrutinised more, meaning it requires more pre-planning and ‘proof’ that it reflects real-world needs. And in my experience, this planning often makes up for the lack of it in developing many ‘traditional’ programmes. Plenty of public affairs practitioners who use online channels to communicate are still perfectly happy to “get their message out” without much thought paid to whether they are actually driving any influence or change. Thankfully, others appreciate that spending time and money on drafting drivel and being followed by a few bots from Vladivostok Is a complete waste of time. People in the latter group are increasingly asking the question: how do we actually know whether our online communications efforts are having the desired effect? It’s an important question, and difficult in public affairs, especially if we seek to measure the effect of online communications on the ultimate public affairs goal, namely policy impact. 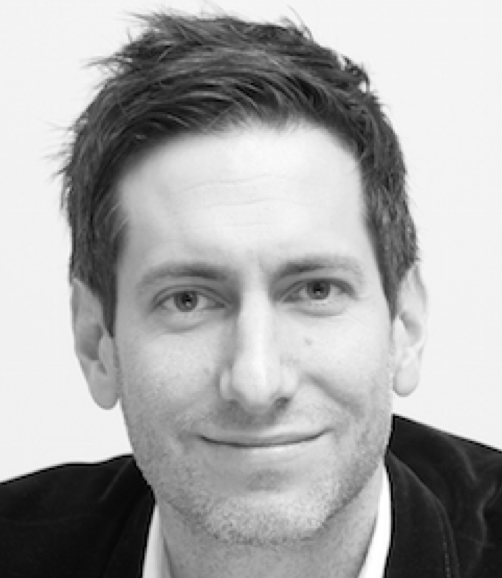 Marketers are usually able to attribute a conversion (e.g. a sale) to preceding steps in the marketing funnel, especially if they all take place online. For instance: a prospective customer becomes aware by clicking on an online ad, then proceeds to ‘interest’ and ‘consideration’ by clicking beyond a landing page or subscribing to email updates, and ultimately makes a purchase online. But the ultimate public affairs ‘conversion’ – i.e. policy impact – is harder to put at the end of a funnel. The steps preceding it are less linear, and decision-makers can shift from awareness to interest to total disinterest back to total conviction due to innumerable outside influences, like pressure from parties, constituents, or activists. It is therefore unrealistic to create a direct line between a decision-maker’s online activity and a political decision. 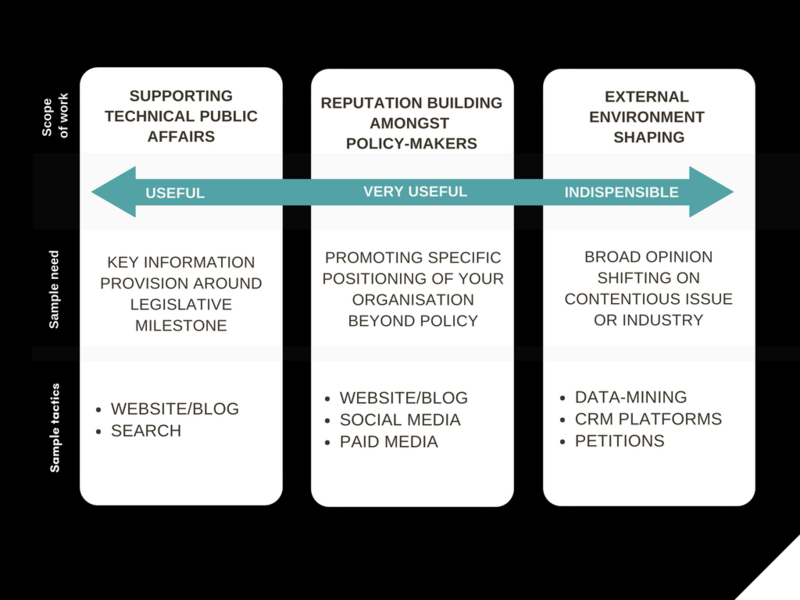 Having said all that, while we may not be able to create a neat digital public affairs funnel, we can still be smart about how we track impact. Do not over-elaborate. Set KPIs tied to fairly basic objectives that are achievable through online means e.g. building a community of relevant supporters or attracting positive interest from previously disinterested targets. Similarly, set conversions that are perhaps less ambitious than ‘policy impact’ but make sure they are genuine ‘actions’ e.g. a key target subscribes for information by email, signs up to an event, or downloads a key position/publication. Integrate on and offline metrics. I’ve never quite understood why most organisations insist on tracking and reporting separately given the obvious overlaps. Most simply: don’t ignore anecdotal stuff e.g. a key person (decision maker, influencer) cited your content in a meeting. A step beyond: interview people or run polls and insert questions about the reach and effects of your online efforts. Stop attributing value to vanity metrics such as likes, shares or traffic. I’m not as militant as some in my profession in that I still think they’re worth tracking, for three reasons: it’s quite fun, people will invariably ask, and if numbers drop or rise dramatically it is good to try to figure out why. But in terms of effects on influence or change, they are negligible. Why? There are two main problems with vanity metrics: even if you have a simple short-term objective such as ‘building an audience of supporters’ a share or like is too weak an action to genuinely denote interest; while many vanity metrics do not allow you to identify exactly who you are reaching/engaging, meaning you have no idea whether you are actually reaching/engaging your target audiences or our aforementioned friend in Vladivostok. I fell into digital public affairs entirely by accident around a decade ago (I’m by no means an early adopter of technologies). But I stuck with it and remain excited by its impact and potential. While we often obsess over how digital can deliver information, its effects on the environment in which public affairs operates is the better starting point. Anyone can communicate to whoever, whenever, making ‘access’ less important, and granting a louder voice to activists. This in turn drives greater scrutiny and increased risk (at great speed, and from farther afield). As citizens, this should delight us. As people in business, it is obviously cause for concern. Navigating all of this with success requires change within organisations: collaboration between business functions; broader and more aligned risk management; new skills; and often more transparent or just plain better behaviour. Which invariably calls for structural, operational, and cultural change. An increasing number of public affairs practitioners appreciate that ‘doing digital’ properly involves all of the above, and not just setting up a couple of social feeds. I have helped some of them evaluate the risks and opportunities that digital brings to their organisations from a public affairs perspective, and have subsequently worked with them on appropriate strategies and operational plans. This sort of work is the most stimulating I’ve done over the last couple of years, and helps explain why digital public affairs and I remain an item. From the perspective of communications execution, digital is of course also really exciting. Given reduced trust and greater scrutiny of business, message and reputation increasingly dictate policy outcomes. The scope for reputation building and environment-shaping on digital are endless, from creative and storytelling techniques, through to social interaction with friends (and foes), and using online tools to manage complex programmes, all underpinned by sophisticated uses of data. As with the digital transformation stuff I outline above, working with clients who make the most of these tools and methods is really motivating. ‘Hate’ might be overplaying it. But I am disappointed by how low digital maturity levels remain in most public affairs functions. Its impact and scope are appreciated narrowly, as it is seen merely as an ‘awareness’ channel for ‘getting a message out’. More sophisticated uses of digital – the fun stuff I describe above – are usually not considered, which can be rather dispiriting. Why not? Brussels remains a policy town, where technical knowledge trumps the science of influence and reputation-building, whether on or offline. Few public affairs professionals appreciate the principles of campaigning and marketing that would make them effective beyond the technical components of their work. And in all honesty, I understand why. The staples of government relations – technical information provision and navigating the policy process – remain the key determinants of success in Brussels. And personal access remains quite easy, so why bother reaching policy-makers online? Moreover, a lot of the exciting components of digital relate to what Americans call grassroots: mobilising supporters to drive bottom-up influence. But European publics are based in member-states, while most PA practitioners have Brussels-only remits (and budgets). Having said that, there is still plenty of scope for digital even on the most technical and Brussels-only dossier. At its basest, it can be used to analyse competition, monitor, and provide basic information via content and search. But more importantly, due to digital (and other forces), public affairs is increasingly moving beyond the prism of the technical and Brussels-only. Reputation-building and opinion-shaping activities are prerequisites for success, and a modicum of digital aptitude is required to do either well.